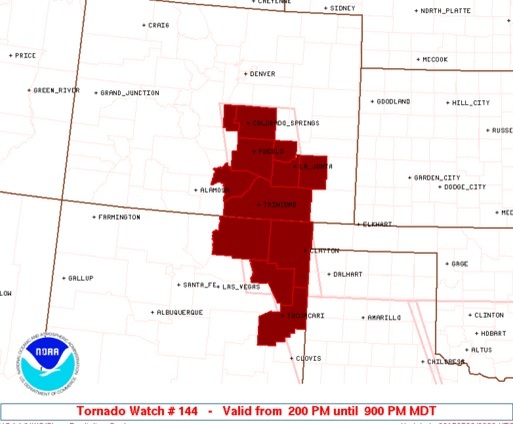 El Paso County, including Colorado Springs and UCCS, are now included in a Tornado Watch until 9:00pm MDT. Stay tuned to local media and be prepared to take shelter if a warning is issued for our area. This entry was posted in Uncategorized on May 9, 2015 by tstoeckl. A Flash Flood Watch is in effect until midnight tonight. Recent rainfall has saturated soils across the area, and with moderate to heavy rainfall forecast today, any additional precipitation could quickly create flooding and flash flooding conditions. Monitor the latest forecast and warning information, and be prepared to take action should conditions warrant it. Avoid driving through standing or moving water on roadways, you never truly know the conditions below the surface. Remember, a Tornado Watch means conditions are favorable for severe weather and the development of a tornado. Be prepared to seek shelter should a warning be issued. Tune in to local media, and check www.weather.gov/pub for the latest forecast and warnings for our area. This entry was posted in Uncategorized on May 8, 2015 by tstoeckl. 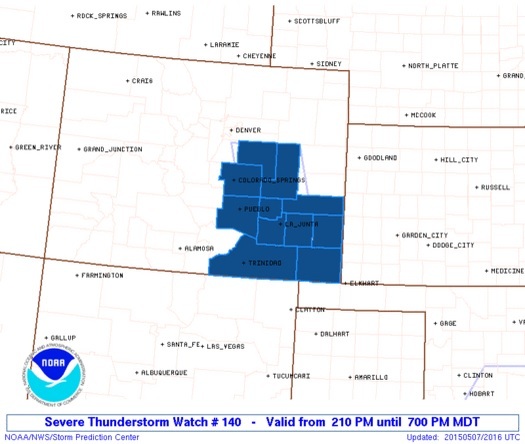 Severe Thunderstorm Watch in effect until 7:00pm MDT…includes our UCCS campus…large hail, damaging winds, and an isolated tornado are possible. Stay tuned to local media, and visit www.weather.gov/pub for the latest forecast details. This entry was posted in Uncategorized on May 7, 2015 by tstoeckl.